Citizens often value the historic resources and landscapes in their municipalities. Historic resources represent links to the community's evolution and sense of identity, help preserve individual neighborhood character, and can provide examples of architecture and construction methods that would not be built or could not be reproduced today. Historic preservation planning provides the municipality with a framework for identifying policies and developing measures necessary to achieve its historic resources and landscape preservation goals. Collectively, protecting resources and their settings provide a holistic mechanism that promotes greater viability, vitality, and continued use of historic resources from both historic and economic perspectives. This tool can be used to identify and preserve structures and other features that provide the physical representations of where a community has been — its past, its history — by linking that past to the present and preserving it for future generations. Municipalities can help ensure the protection of their important historic resources and landscapes by engaging in a municipal historic preservation planning program. Following the spirit of the National Historic Preservation Act of 1966, the Pennsylvania History Code, the Pennsylvania Constitution, and other federal and state policies, the Pennsylvania Municipalities Planning Code requires consideration and planning for historic resource protection. Preservation planning can help a municipality ensure that historic resources and landscape preservation objectives are considered during planning and community development decision making. 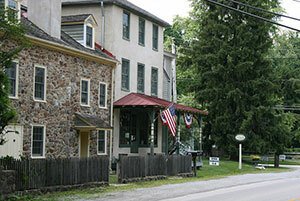 Historic Sugartown in Willistown Township. Coordinated Municipal Goals: Consistency with other community goals and objectives can be ensured when preservation goals are established as part of the comprehensive planning process. Historic preservation planning can also promote greater understanding of historic preservation and how it can be to achieve other community goals and objectives. Resource Protection: Historic preservation planning can help protect historic and cultural resources and landscapes. Educational Value: A greater awareness of historic resources and landscapes can be encouraged, which can lead to a better understanding of their contribution to a community's sense of place and quality of life. Supports Property Values: Property values can be supported, stabilized, and enhanced when a neighborhood's existing older and historic structures are used in economically-productive ways. Community Pride: Historic preservation planning can promote community identity and can support tourism. Energy Conservation: The economically-productive use and reuse of historic resources promotes sustainable development through the continued use of existing structures and their materials. Supports Community Planning: Historic preservation planning can create a framework for formal preservation policies and can promote historic resource and landscape preservation activities such as creating a local historic district, developing ordinance protection standards, or completing a survey of historic resources. 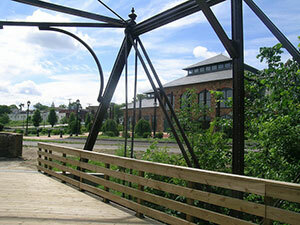 This is an example of a contemporary reuse of a historic structure; the Foundry Building in Phoenixville Borough. Limited Perceived Benefits: Historic resources planning, as an element of municipal planning, can be perceived as having only limited benefit to a community if its benefits are not widely understood or accepted, and can create potential opposition to historic preservation planning and objectives. Balancing Property Rights and Community Goals: Regulating certain property rights is often necessary to achieve overall local historic preservation goals, while the benefits are shared by the owner and the municipality, potentially creating tension between the two groups. No Guarantees of Success: Planning brings historic preservation concerns to the forefront but does not guarantee implementation. Administrative Challenges: Interpretation of ordinance provisions and the uniform application of design standards can be challenging, particularly for new Historical Commission members and constantly changing municipal officials. While standard planning principles of goal identification, data collection, resource analysis, strategy formation, and implementation can be applied to historic resources and landscapes preservation planning, the process should be tailored to the individual municipality. Successful historic preservation planning involves linking historic preservation goals to other municipal goals (e.g. community development, economic development, and housing goals), and incorporating historic and community preservation as an integrated element in the municipal planning program via the municipal comprehensive planning process. In this way, potential policy conflicts can be readily identified, discussed, and resolved at the outset. Broad community input on preservation issues is necessary during the development of a plan, because preservation planning with a narrow perspective may not be credible with the community at large and could consequently result in difficulties upon implementation. The relationship between protecting the local quality of life, the sense of community identity, and preserving historic resources and landscapes needs to be clearly and effectively conveyed and should be emphasized during the planning process. Preserving a community's quality of life can be partially accomplished by preserving those physical features that help create its sense of place and link its evolution and origins with the present. Historic preservation is often key means to accomplishing these types of goal and thus should be viewed as an integral element during the planning process. This is an example of the preservation of a historic site and present day use for community education and passive recreation; Martin's Tavern in West Bradford Township. The following outline describes the individual components involved in historic preservation planning. Identify goals: The first step in developing a historic preservation plan is to delineate goals. This requires the municipality to define why historic preservation is important to the community and develop statements that express these views. Inventory historic resources: Identification, documentation, and evaluation of historic resources forms the basis of a preservation program. A basic knowledge of existing resources is needed in going forward to develop and later implement a preservation strategy. A preliminary inventory as well as preliminary identification of a community's historic character should be done at the onset of the planning process to establish a basis for evaluating proposed goals and strategies. Afterwards, a more comprehensive survey of those preliminarily historic resources and their context and landscapes is recommended, along with more in-depth defining of historic character, which requires an evaluation of the relationship of historic preservation on the community's quality of life and other planning aspects. The community's historic character creates a frame of reference within which historic resources and landscapes can be evaluated. Identify and evaluate local historic preservation efforts to date and available resources: A summary of past and ongoing public, nonprofit, and private preservation activities can also assist in identifying policies, organizations, incentives, and social structures that have been used in previous efforts and can suggest how each can be used to implement future strategies. Summarizing preservation efforts also helps to showcase past accomplishments and the importance of historic sites to the municipality. Cooperative planning and partnerships between various public, private, and nonprofit stakeholders can help achieve additional preservation success. 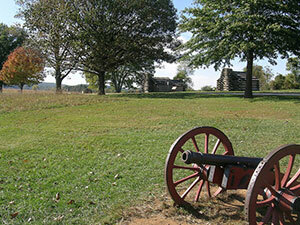 This protected historic landscape setting is in the Valley Forge National Historical Park. Summarize pertinent federal, state, and local preservation policies and laws: Identifying the legal foundation for historic preservation and adopted municipal policy and regulations creates a broad understanding of what can and cannot be done regarding enabling legislation, thereby assisting community leaders in appropriately formulating strategies. Foster citizen participation: Public input and active citizen participation is critically important in two ways. First, it gives local officials an understanding of the existing level of community support for historic preservation in general and in regard to specific efforts or activities. Second, it creates a forum through which residents, property owners, businesses, and other stakeholders can become more aware of historic preservation issues and concerns. Achieving preservation goals is dependent on strong support from stakeholders. Identification of strategies and creating an implementation schedule: Identifying strategies is essentially the "how-to" actions of the plan. Implementation measures can vary considerably and include nominating resources to the National Register of Historic Places, designating a local historic district, and developing historic resource protection regulations. Other activities can focus on education, such as undertaking a "town tour" program. These measures should be developed in consideration and in coordination with other plan topics and measures to help ensure there are no inherent conflicts between various plan strategies. In addition to identified strategies, a time frame for implementation and the entity or entities responsible for each action should be included. Municipalities in Chester County have had success with their historic preservation efforts. The Northern Federation: Nine municipalities and five other associations school districts in northern Chester County (the Townships of East Coventry, East Pikeland, East Nantmeal, East Vincent, North Coventry, South Coventry, Warwick, West Pikeland, West Vincent, the Green Valleys Association, the French and Pickering Creeks Conservation Trust, and the Downingtown, Owen J. Roberts and Phoenixville School Districts) formed the Federation of Northern Chester County, which created the Northern Federation Regional Resources Protection Plan. This Plan outlines historic preservation planning for the Northern Federation. The Northern Federation Regional Resources Protection Plan is available from each of these entities as well as from the County Planning Commission. Malvern Borough: The Malvern Borough Comprehensive Plan, available at the Borough, contains historic preservation policies. West Whiteland Township: The historic preservation policies are included in Natural and Cultural Resources in the Township's Comprehensive plan and standards are located within the Township Zoning Ordinance. Act 247, The Pennsylvania Municipalities Planning Code (MPC) provides the legislative basis for local historic preservation planning, and for the protection of historic resources, through local planning and zoning. The Pennsylvania History Code, Title 37 (Adopted May 26, 1988) defines the duties, responsibilities and function of the Pennsylvania Historical and Museum Commission. These include: providing information and advice on historic resources and appropriate preservation procedures to public officials, private individuals and organizations, advising public officials regarding the planning and implementation of undertakings affecting historic resources, and coordinating and commenting on activities affecting historic resources and preservation activities. Historic Preservation Guidelines, for the Preservation, Promotion and Regulation of Historic Resources (2009), published by the Lancaster County Planning Commission. Preserving Our Places (1998), published by the Chester County Planning Commission. Historic District Designation in Pennsylvania, Michel R. Lefevre, Pennsylvania Historical and Museum Commission, 1996.